Barred, Frizzled, Sizzled, Crested, Naked Neck, Bearded, Feather-Footed, Silked.... FUN! If you like a crazy-looking pet chicken, the Fun and Funky assortment is for you. We have multiple pens with amazing combinations, selected to please.Your order could contain any random selection of the traits above, bred from breeds like Easter Eggers, Cochins, Cochin Bantams, Silkies, Polish, Silchen, Serama crosses etc. Order a bunch of these and you won't be disappointed! 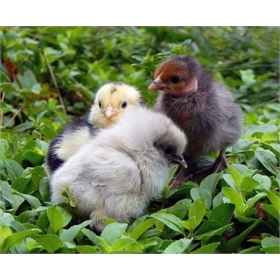 Want exciting breeds without having to hatch at home? 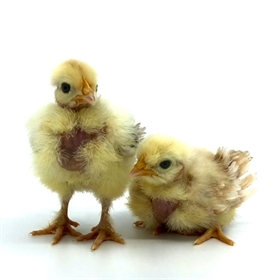 Express Mail shipping is included in the price of our new Chick Packs™ -- straight run value packs of 10, 15, or 20 rare breed and designer chicks. (Select your desired quantity in the pull-down menu above.) Our specialty breeders incubate any eggs left over after fulfilling orders for fertile hatching eggs, and hatch out chicks for those of you who want rare chicken varieties.